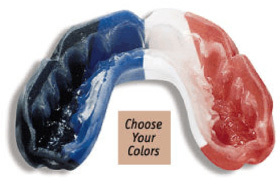 Mouthguards are mandatory for high-contact sports like football and hockey. The majority of mouth injuries occur in children between the ages of seven and fourteen, while they are engaged in casual sports and other common activities like skateboarding or riding a bike. Fortunately, mouthguards can help protect your children from these expensive and painful injuries. Each year millions of children's teeth are knocked out as a result of accidents during everyday activities like skateboarding and hiking. A custom-made mouthguard is a great way to prevent injury and protect your child's smile.